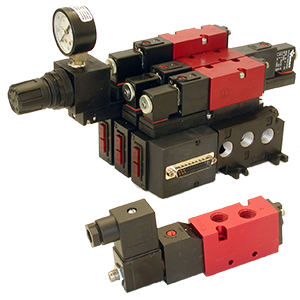 Versa’s C5, C7 & C9, valves are multi-purpose 4-way, 5 port 2 position or 5 port 3 position, solenoid, pilot or manually operated pneumatic valves. C Series valves are available for side porting, rack mounting or manifold mounted with a full complement of manifold options. 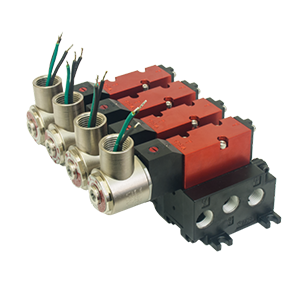 The C5 is a four-way manifold mounted and body ported, two/three position (5/2 5/3) valves, with ⅛” NPT ports standard and ISO G thread optional. An optional Pre-Wired sub D connector can support up to 12 valves on a manifold. 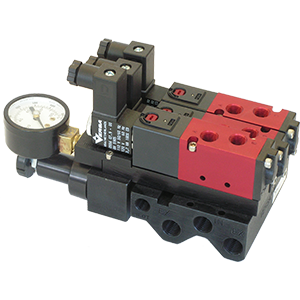 The body ported valves are of a universal flow design, solenoid, manual or pilot operated and can be mounted individually or side by side using #6 screws or on a 2 to 10 station rack mounted manifold. The C7 is a four-way manifold mounted and body ported, two/three position (5/2 5/3) valve, with ¼” NPT ports standard and ISO G thread optional. An optional Pre-Wired sub D connector can support up to 12 valves on a manifold. The C9 is a four-way manifold mounted and body ported, two/three position (5/2 5/3) valve, with ½” NPT ports. An optional Pre-Wired Amphonal 19 pin connector can support up to 8 valves on a manifold. The body ported valves are of a universal flow design, solenoid, or pilot operated and can be mounted individually or side by side using ¼” screws. Overrides – Four types of overrides are available: Standard, Suffix Detail -G, -M and -CML. The standard is a push twist to lock, requires no call out. -G is a guarded momentary contact, -M is an unguarded momentary contact and -CML is a raised grip, push twist to lock. Two styles are available depending on the solenoid pilot cap used; engineered polymer or aluminum. The engineered polymer -CML, -M & standard. The aluminum -CML, -M, -G & standard. Engineered to outperform and outlast all others. © Versa Products Company Inc. All Right Reserved.